My ancient workout clothes are folded neatly (and squished) beneath a pile of sweaters on a shelf in my closet. They were cute — from the ‘90s — when I cared very much about how I looked at the gym. Decades later, I skip the gym and instead walk most days and do body weight exercises, all while clad in a sweatshirt and yoga pants. But whenever I see my old gym outfit (blue leotard “overalls” with a cropped tee shirt built in), I wonder if maybe I’d get more from a gym workout. It wouldn’t be hard to jump back in, would it? It turns out, it’s smarter to ease back into a gym workout when we’re older, even if we’ve been active. And if you’ve been sedentary for a long time, it’s even more important. Why? Because our bodies change as we age. “We lose muscle mass and strength as we get older, and the muscles become less flexible and less hydrated,” says Dr. Clare Safran-Norton, clinical supervisor of rehabilitation services at Harvard-affiliated Brigham and Women’s Hospital. There can be are other changes, too: arthritis that weakens joints, and vision changes, neurological disease, joint pain, or inner ear problems that can throw off balance. There may also be underlying conditions we aren’t aware of, such as high blood pressure or heart disease, that can increase the risk for severe health consequences if we try to exercise today with the vigor of our youth. If you’ve been sedentary for a long time, jumping back into a workout sets you up for injury. “Lifting weights that are too heavy or taking an exercise class that’s too strenuous often causes trouble, and it’s usually a muscle tear or a strain,” says Dr. Safran-Norton. You might also fail to recognize symptoms of heart disease if you are taking medications that mask them, such as beta blockers. If you are taking beta blockers and start exercising again, you should stop if you experience any symptoms that could indicate heart disease. 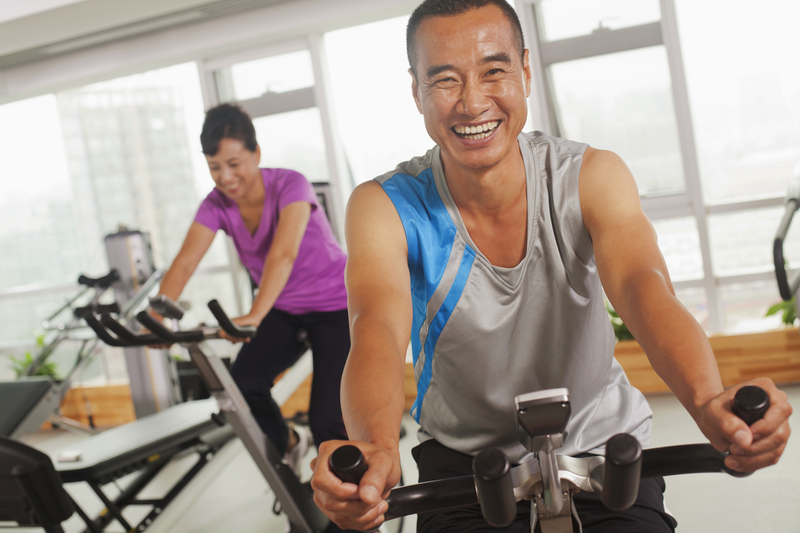 Once you have the green light, think about what type of exercise routine appeals to you, such as taking a tai chi or yoga class, doing a gym or home workout, or going for a brisk daily walk. Make it something you’ll want to do, so you’ll stick with the program. Think of your current abilities as you consider your options. “If it’s a yoga, cycling, or tai chi class, you’ll need adequate strength and flexibility. You need to be able to do the basics, like raise your arms over your head and lift your legs easily,” Dr. Safran-Norton says. To avoid injury, warm up your muscles before exercising, particularly if you are out of shape. Dr. Safran-Norton recommends five minutes of brisk walking or time on an elliptical machine to get blood flowing to the muscles to make them pliable. You’ll need to stretch afterward and repeat the whole process two or three times a week. Don’t feel self-conscious if you’re not the fittest person in the room, if you need to modify a particular exercise, or if you need to take breaks. And don’t feel funny about your gym attire. We’re all older and wiser about health. And we know now that it’s more important to feel good than to look good. Gyms everywhere could really benefit by hosting seminars for mental well-being, boasting mantras and posters from positive body image campaigns. Better to check with your doc if you DON’T start exercising. Just start gradually if you have been inactive. Bicycling and swimming are excellent. If you buy a treadmill, etc, learn how to use it safely. Unlike my patient who was tossed off her new one when she turned it on. Injuring herself.